Tenchi in Tokyo Shin Tenchi Muyo! The above info came from Dean, and was edited by yours truly (contact me). The image came from Mini Anime Img. Gallery. Ryoko is in actuality a creation of Washu's, but she was stolen by Kagato and driven to a life of crime. After a messy business on Jurai, Yosho chased her to Earth, where he managed to trap her in a cave. Later, the Masaki Shrine was built as a safeguard. But then, Yosho's descendant Tenchi frees her from a 700-year imprisonment. She wakes up bent on revenge. Unable to find Yosho, and full of pent-up rage, she takes her anger out on poor Tenchi, using her powers to wreck the building. Fortunately, Yosho's Master Key (which doubles as a light sword) was also in the cave, and it helped Tenchi knock out her jewel, leaving her powerless. Ryoko was now dependent on Tenchi for her safety, so she casually moves in. Ryoko begs Tenchi to relinquish one of the sword jewels so she can reach Ryo-ohki. Just in time, for she had sensed Ayeka coming and wanted to get them outta there. 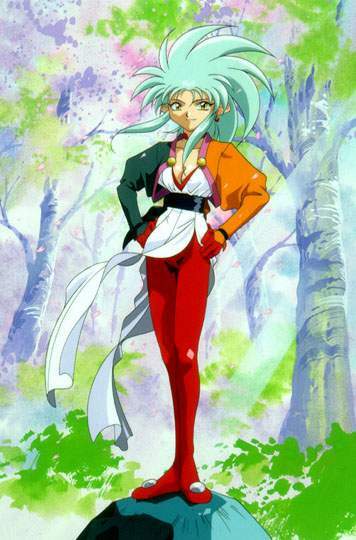 However, Ryoko underestimates Ayeka's powers and is capured, but Tenchi later frees him (without knowing just how he did it), and she gets him back on her ship, forcing Ayeka back down to Earth and demolishing both ships. Fortunately, everyone except the Guardians made it out okay. As for Ryoko herself, her feelings for Tenchi develop into affection, and thus she and Ayeka open another chapter in their long rivalry. Also fortunately, her ship managed to regenerate in a way, and a new Ryo-ohki entered the scene, with just as strong a bond on Ryoko as the former. Technically, Ryoko is a free woman. Her criminal files have been erased due to statute of limitations. Just as well. Ryoko is a free spirit who hates responsibilities or other restraints. And it's probably not necessary to say she hates Ayeka. The above description came from Who Wants to Know?, and was edited by yours truly (contact me). Ryoko, the most wanted criminal in the galaxy, just happned to be in the middle of a hangover when she ends up pursued by the Galaxy Police! After a brief but fierce firefight, she crashes on Earth, where Tenchi soon finds her. Soon after she awakens, she begs him to save her, claiming that she was being chased by a space pirate. They eventually end up back at the Masaki house, where she attracts Noboyuki's attention and begins to make herself at home, lying whenever necesary to attract the necessary pity. Then, things get really wild when Ayeka, the one person she totally detests, happens into her world, and right away she sees things going all awry. First, Ayeka falls for Tenchi, creating an intense love triangle. Then, she has to deal with Ryo-Ohki's compulsive carrot habit, a habit which leaves Ayeka stuck on Earth (to her disgust). And just when she was starting to relax around Mihoshi, Kiyone appears and (with Ayeka's help) almost captures her. Only Mihoshi's dumb luck saves her. She's still as sly as ever, though, willing to use virtually every trick in the book to get what she wants. If it isn't for Ayeka and everyone else, she just might succeed.